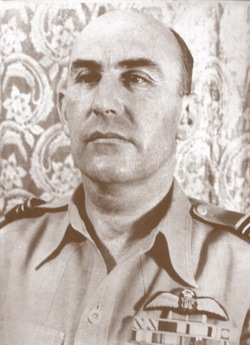 In1951, Air Vice Marshal Sir Richard Atcherley then Commander-in- Chief Royal Pakistan Air Force (C-in-C RPAF) suggested the Prime Minister of Pakistan Mr Liaquat Ali Khan and the Defence Minister Iskander Mirza that a "feeder school" be established to provide flight cadets for training at PAF Academy (then PAF College), Risalpur. He said that if a Pakistani boy could be given the same standard of education as his counter part in the West, he would make every bit as good an officer and pilot as any officer in the West could . Atcherley's idea was given an enthusiastic support and in 1952 the Defence Committee under the chairmanship of Liaquat Ali Khan approved the project. An agreement was signed with the Air Service Training Limited Hamble,South Hampton, UK to operate and manage the project for the first five years. The Board of Governors included the Defence Minister Iskander Mirza as the Chairman and C-in-C RPAF Air Vice Marshal Leslie William Cannon as the Deputy Chairman. The site selected for the project in Sargodha was known as "Dhup Sarhi" meaning "Sun Burnt". The project took off in December 1952 as the British contract staff including Principal and eight teachers flew from London in a K L M Charter plane. The plane suffered an unpleasant experience of crash landing in the Arabian Desert near Darain. Fortunately no one was hurt.